Books | Curses! Foiled Again! Eccentric, reclusive genius Willis Linsay of Madison, Wis., publishes on the web instructions for building a strange device consisting of a handful of common components, some wires, a three-way control and a potato. A flick of the switch (“west” or “east”) sends the builder into an alternate Earth–one of a possibly infinite sequence–where there are no humans at all, though there are other creatures descended from hominid stock. Some people are natural “steppers,” able to step into the Long Earth without any device. Another minority are phobics, unable to step at all. Steppers can take with them only what they can carry, while iron in any form doesn’t cross. Thanks to the strange circumstances of his birth, Joshua Valienté is a natural. The transEarth Institute, a wing of the huge Black Corporation, offers him a job exploring and reporting on the new worlds. His partner in the enterprise will be a zeppelin inhabited by Lobsang, a distributed artificial intelligence whose human component was once a humble Tibetan. Meanwhile, back on Datum, the original Earth, officer Monica Jansson grows increasingly concerned about the anti-stepping rants of powerful demagogue Brian Cowley. Thousands of steps from home, Joshua runs into another independent-minded stepper, Sally, who turns out to be Willis’ daughter. They visit a community, Happy Landings, founded thousands of years ago by natural steppers and trolls, gentle hominids who communicate via music. But both trolls and their viciously homicidal cousins, elves, are step-fleeing toward Datum from something very scary indeed. You can pre-order it now, and it comes out June 19. I’ve already added it to my B&N Nook Library (I guess it will show as a “free preview” when it comes out and I can order it then). It also reminds me that I need to get caught up on my Discworld reading, and get my dead-tree library caught up as well – I have every Discworld book up through Going Postal, but I’m missing a couple of the ones after that. On a related note, yesterday was payday, so one of the first things I did was buy the e-ARC of Larry Correia’s Monster Hunter Legion. I’m about halfway through (I had to recharge my Nook, and didn’t feel like reading on the computer screen or while tethered), and I’m liking what I see so far! Keep ’em coming, Sir! I found this over at Daddy Bear’s Den. NPR’s list of top 100 SF and fantasy books. Like DB, I’ve bolded the one’s I’ve read. If there’s a star, I haven’t read the entire series (yet). Two stars means it’s “in progress”, and three means I’ve partially read it but never finished. The “dagger” (†) indicates it was required reading for school and not something I would have read willingly. The ∞ means I very highly recommend it. Right now, I’m reading E.E. “Doc” Smith’s Lensman series. So far, it’s pretty good. If you’re interested, the first book, Triplanetary, is available for free at Project Gutenburg, in multiple reader formats plus html for reading online. Generally, I see ebooks as supplements to real books, anyway. I’ll buy the physical copy of books I like enough about to make part of my collection (which ends up being most of the books I read), but if I don’t like it, I’ve spent less on the ebook than I would have on the hardcopy. Both have advantages and disadvantages, and one is not a complete replacement for the other. E-books are nice. The e-readers are more compact and easier to travel with than most regular books, and they give you the ability to carry as many books as you would like at once without having to carry around an extra suitcase (or more) just for books. 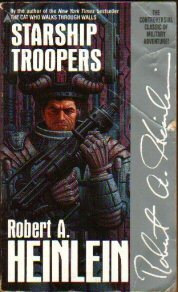 With free e-book sites like Project Gutenberg and Baen’s free library, you can download an amazing number of free books that are DRM free – some of which are also out of print and hard to find. 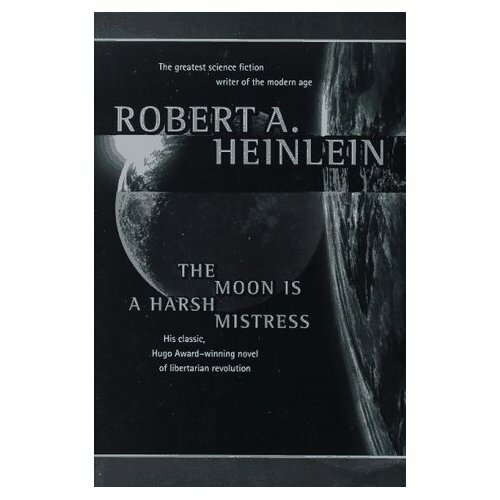 There are, of course, the big sites of Amazon and Barnes & Noble for paid titles, even if they are DRM restricted, and there are some publisher sites out there as well – foremost among them being Webscription, which is run by Baen publishing, where all titles are DRM-free and some advance copies of new titles are offered before the official publication date. But, even with all of these advantages, nothing beats holding a real, paper book and reading the printed words off an actual physical page. If I buy an e-book, chances are that I will also eventually buy the physical book as well. For some books, having a physical copy is simply as mandatory as breathing. My latest acquisition goes beyond even that. The Hobbitt by J.R.R. 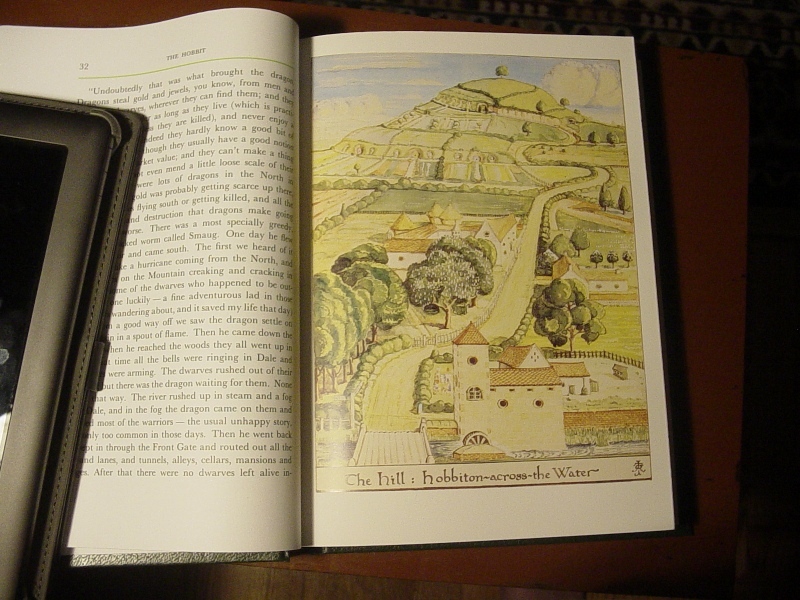 Tolkien is one of those books that just cries out for you to own a hardcover, leather-bound* edition. With a $35 price tag, plus my B&N membership discount, plus the recent release of pictures from the upcoming movie, I just couldn’t resist any longer. So today it is mine. This is a boxed edition, and both the box and book appear to me to be well made and quite elegant. 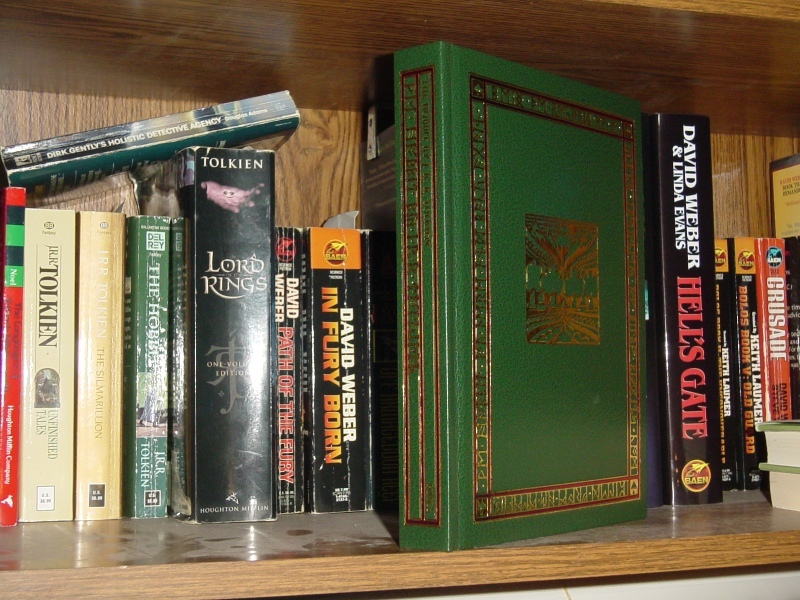 As you can see here, the cover and spine are decorated in red and gold leaf, with the title and author information in both English and in dwarf-runes. It also contains several beautiful illustrations, in addition to the original maps. And yes, I did use my Nook Color to hold it open for the picture. A beautiful edition of a wonderful work of literature. 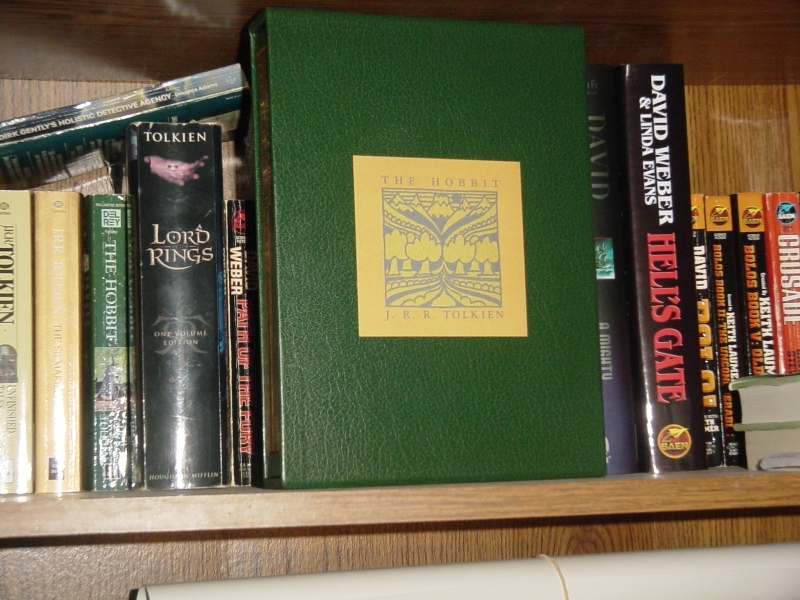 Now, I just need to save up and get the similar edition of The Lord of the Rings. The 50th Anniversary Edition looks good, but I do really want the Red Leatherette Collector’s Edition – a callback to The Red Book of Westmarch from the story. * Leatherette in this case, but I think true leather-bound books are only rarely made these days, and this is as close as I’ll probably ever actually be able to afford. Posted in Books, Currently Reading, Geek Stuff, Philosophy, Shiny!